Within the terrain of post-Althusserian Spinozism perhaps the most glaring point of tension is between Spinoza's work and Althusser's posthumously published "aleatory materialism." While it is possible to see the connections between Spinoza's immanent causality and Althusser's structural causality, and Althusser's famous essay on ISA's is pretty much an application of the Appendix to Part One of the Ethics to post-68 France, it is harder to connect Spinoza's sub specie aeternitatis to Althusser's philosophy of the encounter. Such a connection would seem to be the product of a delusion. "The hermeneutic circle has come full turn: Althusser's outline renders intelligible Spinoza's theory of temporality, while receiving an ontological foundation from this intelligibility in return. And yet, this circle is not a pure, zero-sum game of interpretation. The game creates a displacement; it creates a definite distance from the theological temporality into which Spinoza's interpretation of eternity often relapses." This idea of multiple times, of the present, as the relation of different times, has as its corollary a rereading of the idea of encounter. It is not a matter of thinking encounter as an event, as a kind of rupture, but of the primacy of the encounter to form. The encounter is not something that happens once, but rather it is the very fact of the primacy of relations. As Morfino argues, the central thinker of aleatory materialism is not Machiavelli or Lucretius (and certainly not Heidegger) but perhaps Darwin; it is Darwin that makes it possible to think reality as the conjunction of multiple encounters without a teleology or order. It is a matter of thinking the order and connection of nature not as some linear causality, but as the intersection of multiple causalities. It is a matter of thinking of reality as relation. 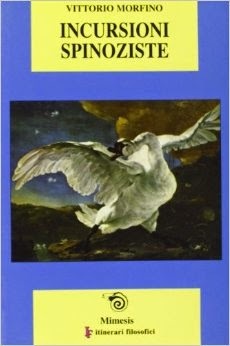 François Zourabichvili's Spinoza: Une physique de la pensée also engages with a rethinking of the question of form in Spinoza. For Zourabichvili Spinoza's innovation with respect to relation has to do with his redefinition of individual body as being a relation of motion of rest. This not only breaks with hylomorphic conceptions that understood as individuation as a relation of form and matter, but of the entire conception of the soul caught up in such definitions. As the title suggests Zourabichvili is less interested in Spinoza's redefinition of bodies than what this redefinition means for thinking of mind, of thought. If the soul is no longer the form of matter, it too must be a relation of motion and rest. The mind is only an idea of the body, sharing its basic relations and structure. Or, put more plainly, mind is nothing other than a series of relations of ideas. Some of these ideas are singular, reflecting particular relations, and others are ideas necessitated by other ideas, reflecting more general relations. The mind, like the body, is nothing but constant relation of relations, constantly being nourished by its encounters with other ideas. Morfino and Zourbachvili demonstrate that Spinoza is a paradoxical philosopher. The supposed philosopher's philosopher whose concepts actually make possible a radical redefinition of the very ideas of essence, relation, body, and mind. Spinoza in this sense is a radical pars destruens of the received vocabulary of philosophy. However, this promise poses its own particular challenge for the very practice of philosophy. It is not enough to simply assert "relations, contingency, encounter," against the old metaphysics of substances, necessity, and forms, but any real knowledge of relations must depart philosophical speculation to actively grasp the relations that produce the current encounters, the ideas that produce ideas. On this reading Spinoza is not just a complement to Marx, the ontology the latter was lacking, but another version of the same intellectual imperative, to think the complex relations that actually constitute the world.